Hiss vs Alexinho. Although it may not seem like it on the surface, this battle was an era-defining one for the international stage. Aside from the fact that it was an amazing battle, the implications were huge. Online community versus event community. A newcomer versus one of the most experienced on stage. A kid versus his idol. So many underlying factors led to this being a battle for the ages. 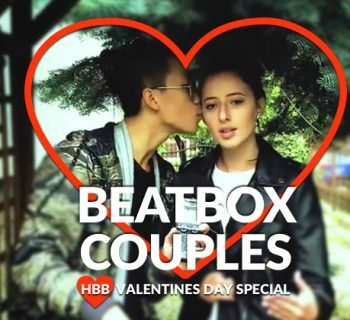 So let's break this battle down in the first of my new series called Beatbox Breakdown. Let's start with what we know about the two beatboxers going into the battle. Alexinho has been in the scene since he was young, and has performed in a number of venues many different times. Arguably, he has the most stage experience of any current-school battler. He commands the crowd, and he truly utilizes his space while he's battling/performing. He loves to mess with his opponents by getting in their space or playing with them (handing his opponents or spectators the microphone during his round is a popular Alexinho move). He's the noise making, fourth wall breaking Charlie Chaplin of the beatbox scene. And he LOVES to improvise. Hiss has a lot of experience in online battling, and little experience interacting with other beatboxers in the scene. He is excellent in using this to his advantage. He has honed all of his sounds and created beautiful patterns since sound is all that matters online. With this being his first major international event, we don't have much to expect on stage, aside from the sick beats we've seen on his shoutouts and local battles. And he LOVES Alexinho. You'll see why this is important soon. Alexinho starts his round with his signature high bass, getting up in Hiss's face as we expect. Hiss stands confident, not letting Alexinho get to him throughout the entire battle. Alexinho alternates between getting in Hiss's bubble and facing the crowd during the entirety of this round. About 50 seconds into the video, Alexinho makes a TINY slip-up in keeping time, and Hiss is there within 2 seconds to call him out on it. It's clear from this point forward Hiss is focused and determined to use everything he hears to his advantage. At 1:05, Alexinho walks up to Hiss and does some off-beat technicality, as Hiss looks to a friend in the audience that seems to gesture back. Hiss makes a small "bite" motion with his arms (if you know why this is the case, please let us at HBB know! Still a mystery to us), and Alexinho laughs it off and faces back toward the audience onces again. He gets the audience moving with a simple wave of his arms. Alexinho says "esh!" to the audience, and like magic they all repeat in back to him on beat! Alexinho finishes the rest of his round cleanly, and ends with some heavy Alexinho-signature technicality in Hiss's face. Hiss is unphased, joking back at Alexinho. A great round overall, with crowd appeal, musicality, technicality and classic Alex. Remember how we mentioned Hiss loving Alexinho? Well Hiss begins his round with some unexpected battle tactics. He spits Alexinho's technical beat back at him almost as well as it was just heard, and then gets into his own style. 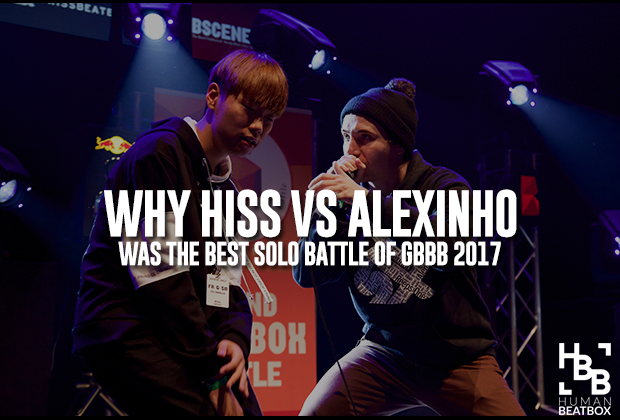 Throughout the round you can see the influence Alexinho's stage style has had on Hiss, as he works to command the audience in similar fashion. Hiss starts his set with some nice musicality. A low trumpet and rolled trumpet melody, and builds with some clean power. He drops into a hard-hitting house beat with click roll bass, and to our surprise once again, hits us with another fun battle tactic. In the middle of the first portion of the drop, he does Alexinho's signature melody line, "mmBAHmmBAY", from an old routine of his. We saw in Hiss's battle versus Slizzer he did a similar tactic with Slizzer's classic chest bass/sucker punch combo as a fill. This gets the crowd's attention (and reaction) as Hiss progress's into drop part two: hollow click structure. This catches the judges attention as well, and Hiss gains ground. This is a perfect segue into the last portion of his drops, which is his shoutout to Zer0 (who unfortunately could not make it to this year's GBBB) with clicks on clops. He brings the round full circle by ending with the trumpet melody from before, and Alexinho immediately snatches the microphone to get right into the next round. Overall an incredibly structured and well-rounded performance, with a lot of unique things we hadn't seen on this stage yet. Alexinho attempts to use the "repeat the beat" battle tactic that was just used on him to start the round, and it's about as good as the last time we saw it. He transitions the melody nicely into his "Make It Bun Dem" routine, dropping it with a wonderfully improvised line regarding the timer malfuctions, and the crowd loved it. He then continues with what seemed like an off the cuff beat including high bass and some hard kicks, which seemed a bit similar to a beat he did in his first round, leading Hiss to throw up the "repeat" symbol. Alexinho builds with some tech that is similar to his second round versus Two.H, and drops with that familiar upper lip bass under the previous melody. Hiss counted Alexinho down, prepared to start his own round. Overall another classic, clean Alexinho round, but felt a bit like the sounds had been used already. Hiss comes out of the gate swinging, grabbing the microphone and NAILING the aforementioned bass Alexinho closed out his round with. Hiss learned this from following Alexinho for some time, and is one of the very few other people in the world who can cleanly replicate this sound. The audience is eating it up. Hiss eagerly starts his own material with some tongue bass technicality that lacks the power we had become so adjusted to this battle, but is nevertheless impressive. He builds to a confident drop with a classic Hiss beat, including tongue/click rolls and zippers and mad speed. He rounds back to the previous technicality, and closes out his round with speed, cleanliness and confidence. We see a lot of the new school style in this round, and it did not disappoint. Hiss won in a surprising but understandble 3-tie and 2-Hiss vote, and he collapsed to the ground in shock and happiness. 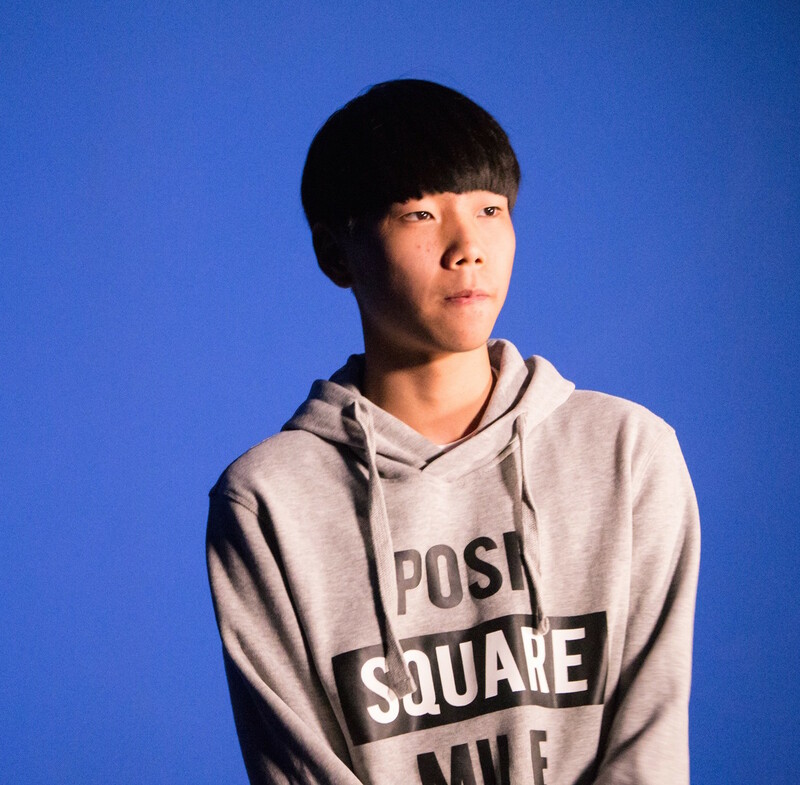 He had just beaten his idol, and at age 16 made it to the Grand Beatbox Battle Solo Finals. Breaking down the result is hard, because I'm sure noone would have been disappointed to see an overtime round. There are some things that are important to note. In terms of battle prowess, Alexinho commanded the stage and the crowd definitively. He moved about the stage with intention, whereas Hiss for much of the battle paced uncomfortably, more or less waiting for his drops to really get into it. He was faced toward Alexinho a lot of the time, and did little to address the audience or the judges. 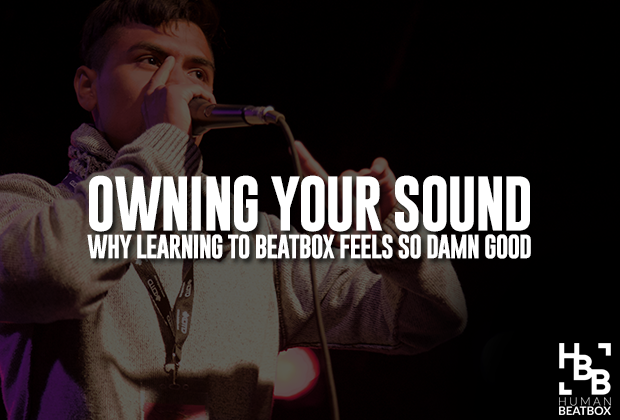 It makes sense; it's not easy to battle one of the best stage performers in beatboxing. As the battle moved forward, Hiss gained confidence on stage, and made more intentional body movements, clearly feeling the energy and the support from the crowd. In addition, Hiss's battle tactics paid off in dividends. His beat repeats were clean and successful (and superior to Alexinho's), and filling space with his opponent's signature melody line landed incredibly well with the audience. From a music perspective, Hiss brought to the stage something Alexinho couldn't: new beats with a new perspective. Hiss did combinations not yet heard on the international stage, and he did them with power and cleanliness not expected out of a new battler. Alexinho's pieces are always entertaining and ever clean, but Hiss brought a fresh style to the stage that he absolutely killed. We can't wait to see more of Hiss in the future, and we expect to see him more often on the international stage! Let me know if you want more of these breakdowns in the future! All feedback is not only appreciated but encouraged, and if you have any suggestions, comment below! TBH, It’s hard to translate all of the beats and gestures in the battle that you’ve been wrote!~ You did it well………. I think the ‘bite’ motion was a small taunt to Alexinho, sort of like saying ‘bite me’. It’s like Hiss is saying that he’s not scared of Alexinho. Yes please, more of these breakdowns!